You have long been in the industry, are you not tired of doing the same thing all the time? This is just like asking a doctor who is doing his work if he is not tired of being a doctor, or if he is not tired of saving lives. That is the same question you are asking me. But I would say, really, I am tired of doing the same thing over and over. And for some time now, my focus has changed in the sense that I am embracing more of international feature co-productions that I do in different countries with colleagues from these countries. I just returned from Cameroun about a month ago where I went to direct a film, which I also starred in. I took along some actors and some of our crew from Nigeria. I was invited to Benin Republic where we went to shoot in French, it was a film directed by Tunde Kelani. Some of my colleagues came from Ivory Coast and some came from Benin Republic as well. It's a movie that was shot in French, and some of it has been sent to the Swiss effects laboratory in Zurich to see how they can blow it up to cinema projection. I will be in Liberia in August to do a workshop on acting for some Liberian youths and also to direct a film for them. And I am also packaging some productions that I'll do in the US with some colleagues from there. The issue here is that, it appears we are doing the same thing over and over here. You get tired of just doing the same thing. It's like we are just wasting time, we are not improving on distribution, which means the take home pay of the actor is not improving. As long as we are not improving on distribution and we are doing the same thing, it means we are not improving on our standards. It means instead of improving, we are just going backwards. But when you get involved in doing things with people from other countries you begin to look at new ways of telling your story, you begin to get new story ideas. You begin to aim higher and you start to see how people are doing things in other places, and that helps to you to take a critical look at what you are doing back home and steps to make things better. That is precisely what I am doing now. So my work is taking me out now. Why haven't you thought of changing the way things are done here instead of seeking fresh lease abroad? It's not as if I am not doing anything here. What I am saying is that the movie industry in Africa does not revolve around Nigeria, though we are occupying a vanguard position. But at the same time, it is unhealthy for us to think that we are like an island, to think that on our own we are self-sufficient. Even though our population makes us the biggest country in Africa, we are still one country in ECOWAS. You'll discover that there are more French Speaking countries than English-speaking countries. So, when you look at all these, you'll discover that, there are little atomistic market from one little country to another; and it makes a whole lot of sense to embrace all of these people and see how we can make Africa our common platform, not just Nigeria. As such, we will begin to look at new storylines and distribution market. At the end of the day, the essence of the whole exercise is to bring some of the experiences back home to make the industry better. When you were the Actors Guild of Nigeria president, did you try in any way to bring about change in your industry? Let's get one thing clear, the Actors Guild is just one guild in the movie industry. It is not like the ANTP where you have one body that is like an umbrella body for producers in the Yoruba genre, or films in the English genre. In Nollywood. We have seven different guilds and the Actors Guild is just one that is like a union for the welfare of its own member. The difference here is that I am not only an actor, I am a film maker. That makes me also a member of the association of movie producers, a member of the directors guild, and also a member of the film makers association of Nigeria. So I meet with my colleagues from other guilds and a number of times, we try to introduce a lot of things and look at things that are happening in the industry. At that point in time, we are always in constant touch with the various bodies that deal directly with the movie industry, like the Censors Board, the Film Corporation, and Copyright Commission. We were on a regular parley with them about issues concerning the industry. The industry is a place where one man does not make a change. You may generate an idea, but you need colleagues from other guilds to put heads together to see how you can effect this change through your members, through these bodies. What exactly do you think the movie industry is not doing right? We need to improve on our scriptwriting. A script is like the Bible of every production, in the sense that every film you do is based on a story from a script. That determines exactly what you are going to do. That determines who you are going to cast for one role or the other. That determines the size of your cast, who you are going to employ as your crew. I hope the new president of the Script Writers Guild, Mr Tony Ani, would really sit down now and start looking at script writing as a very serious matter that affects the entire industry; because it is from the script that you have a moving project that you want to do and you employ all the other professionals together to actualise that script. So the area of scripting is one that I know we need to do a lot of work on. In the area of production culture too, there are some basic things that must be done, especially our sound. I am praying that we begin to take care of some of these things. Even during post-production, there are so many other things that we should do in terms of picture correction, picture enhancement, sound design and all of that. How really can these problems be addressed? The issue is all about orientation and culture. Most of our people don't think it is necessary to spend extra money to get some of these things done properly. In a way I won't blame them so much, because they are thinking so much about how much they are spending, what they are going to make, if they are going to recoup their money and all of that. So they want to be as frugal as possible. But you cannot be frugal to the point of foolishness that you don't care about picture and sound, that you just go ahead and shoot because you just want to release a film. Have you ever done a movie that you wish you never did? I'll tell you what happens on locations most of the times. Some of us correct a lot of things on our scripts. We are operating in a jungle setting, what we are doing is jungle shooting and when you operate within these constraints, there are things that, given the circumstances under which you operate, you cannot change within the short time, but you keep hoping that things will get better. There had been so many instances where I had to correct scripts grammatically. You see scripts and you begin to wonder who wrote the script, and in some cases the director doesn't even know any better. At the end, every scene you are involved in, you try to correct some things, and there are a lot of notes you are making on your script because of the corrections. You are a director, an actor and film maker. Is that not like Jack of all trade? No, it's not, I'll give you an example with Hollywood, which we use as a yardstick because it is the centre of entertainment all over the world. We have a lot of young black actors who have worked over the years as actors, and with their experience they are getting into production and directing because they want to be in a position to decide what goes into the markets. They want to be in a position to correct certain stereotype notions about black people. You work for so many years as an actor but because you have the mind to correct certain things, like I mentioned, you want to get into directing and production. That gives you the choice to bring certain projects into the society. For example, I did a film in Uganda last year, which I directed and also starred in. It was about HIV/AIDS and living with people with the virus and not ostracizing them. Now, if you are not in a position to decide, you cannot bring such films into the market. Look at Denzel Washington who we all know to be an actor, but he has veered into production and directing. It's not being a jack of all trade at all, because its happening everywhere. But you also veered into music? No, I didn't veer into music, I've been doing musical scores for films since 1996, which is what most of you don't know. How come you didn't leave it at movie sound track instead of becoming a full-fledged musician? I am doing a musical work right now along with my wife. It's a ten-track gospel musical project, its almost ready. As a matter of fact, during an Easter musical show at the stadium here, we performed one of the songs with our group of dancers. Why did you finally decide to do an album? Talent is like a hunger that if you do not satisfy, you will never get fulfilled. For me, even before I came into the movie industry, I had been singing. I did my first demo in 1987, that's 20 years ago. In my secondary school, I used to sneak out at school to go and sing in the club. Before I came into the industry, we had a gospel musical group, called the Rock Foundation. My wife and I used to go from church to church to perform. We used to play the guitar too. Musically speaking, I have been there. It's just that I have been concentrating more on acting. Why gospel, are you that religious? It's not a question of being religious, it is the kind of music that I want to do. It's not just gospel that I do, I also do inspirational music and situational songs. I have a song called Forgive Me that I wrote specially for my wife. What did you do to her that you were asking for forgiveness? I can't say it now. When the time comes, the whole world will know. Of all the movies you have done, which would you say was the most challenging? Every script or movie role is challenging. What we do as actors is create illusion of being somebody else to be able to tell a story to viewers. And it takes a lot to remove yourself from your character and put yourself in the skin of another person and convince people that you are that person. So as far as that goes, every movie role is challenging; but some are more challenging, maybe because they are action films or deeply emotional films that call for a lot on you. Some of the films that I have done that have been very challenging is Blood Money, which I did years back. The film that I did in Hollywood last year along with some colleagues of mine over there was also very challenging. The first movie I did which was Unforgiving Sin, an Ibo film, brought me to limelight. It was the first Ibo film that was subtitled in English. That was the beginning. How does it feel being in the same profession with your wife? It feels normal. There are families where the wife and husband are doctors, lawyers, soldiers even. It simply means that you understand each other's scheduled better. So if I have to come home late because I am on location, she won't question me unnecessarily and vice versa. Going down memory lane, did you meet on the job? No, we got married before we came into the industry. We met immediately after my youth service and we courted for three years. At the time I met her, she was a member of the Anambara professional theatre group. So she has been there. Does she feel comfortable seeing you do love scene? You should ask if I feel comfortable seeing her do likewise. It goes both ways. So, do you feel comfortable seeing her do love scenes? I don't feel too comfortable, but it's a job she has do. It's all in the line of duty. You have always played the husband and wife role with Eucharia Anunobi more than any other actress, which usually comes out good. Are there female actresses you love to play certain roles with? There is certain chemistry when you work with some people. I have worked with a lot of people, I could say that I have worked with almost every major female actress in this country; I have always connected very well professionally with Eucharia, Stella Damasus, Omotola. There are people that when you work with them, because of the professionalism with which they do their work, it brings out the best in you. You know that when you work with people like Olu and Joke Jacobs and some other people, they just help bring out the best in you. 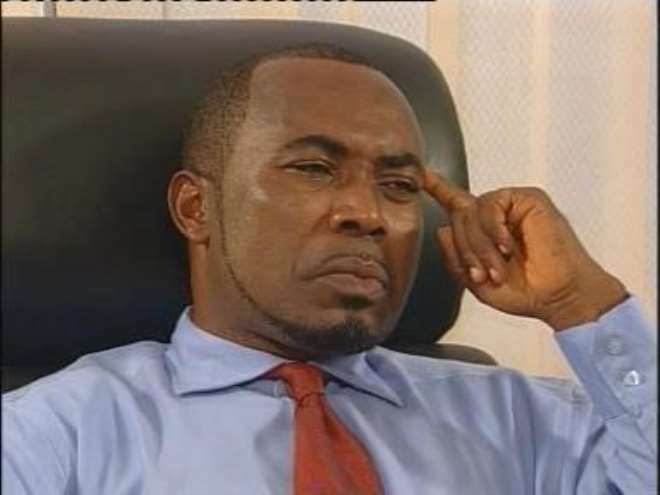 Where do you draw the line between Zack Orji the man and Zack Orji, the actor? When I get out of set, I leave it and then I become myself. I leave it there and then become myself. Then, how much of you do you put in the movies? We all put part of us in every role that we do, because the tools with which we deliver our craft is our body. We use our eyes, our month, we laugh the way we laugh. We use our hands legs every part of the body. The part of womanising, is it you or is it an act? Remember what I said, we create the illusion of being someone else; we are delivering a character. This seems to be very important to you. Well, I don't womanise. How would you say people react to some certain roles you play? The thing is that every human being is capable of anything under certain circumstances. But then, we are all bound by certain laws of nature and we keep certain restraints on our selves because of our experiences and backgrounds. But everybody is capable of good and bad to a certain degree. So, give an actor the right script and the right motivation and he will draw from somewhere and deliver that character to you. It doesn't necessarily mean he is that way. Take Segun Arinze for example, with his assuming mean looks (laughs). But he's a very gentle guy. If you meet him in real life, he's a great guy to be with. In the movies, he's a different person if you give him such mean roles to play. Have you been embarrassed by your fans on the streets? All over the world, actors seem to get into one scandal or the other, but in your own case, you've not gotten into any. How have you been able to do it? Is it because you and your wife are in the same profession, or have you simply been very careful? I've just been myself. I am a very simple guy. If you meet me on an average day at home, I can walk around with my shorts, lie on the rug, play with my daughter. I just do the normal thing. I am a normal guy just doing my work, the difference here is the content of our work. How come you always dress like a young guy? Yes. It depends on where I am going. I wear tux for formal occasions. I also wear native clothes. It is just that I like being free and our weather is too hot.